The proliferation of video, growing importance of distance learning, and new regulations and litigation related to accessibility has most higher education campuses renewing their focus on video accessibility. Our whitepapers and eBooks provide campus executives, technology managers, accessibility coordinators, and other decision-makers with the information they need to make informed decisions. 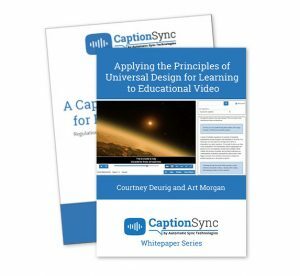 Current topics include captioning and describing video at scale while maintaining equally effective communication, and leveraging Universal Design for Learning principles when using video for education. To receive a copy of our latest publications, please tell us a little about yourself. We’ll email you copies promptly. In the meantime, you may want to check out our past webinars for additional information that you’ll find useful if you work on accessibility policy and solutions, such as our latest on Creating Inclusive Learning Environments with Accessible Video (no registration required).